Perfecting the absolute BEST Vegan Pizza has been an obsession with me over the last few years, and I must say I believe I have it down to a science…..and it all starts with my absolute favorite Herb Crusted Pizza Dough. 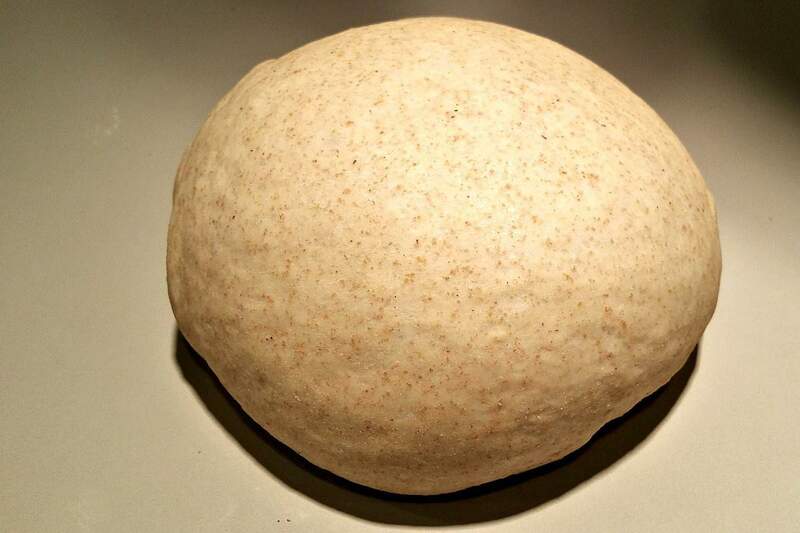 But be warned – this is NOT some quick or ‘no-knead’ pizza dough. Nope – this is the real thing – just like the big boys make. And with a little time, patience, and the right equipment, will make the absolutely BEST pizza you’ve ever tasted. Pizza dough is very easy to make. If you have too much water, you have a wet, sticky mess. Too much flour and you have a brick. Leave out the yeast and you’ll have a piece of cardboard. And without the salt……well I’ve done that by accident a few times, and the results weren’t that great…so don’t forget the salt. So it’s not so much the ingredients or the proportions that make a good pie….they’re already set. It’s more about the technique. We start by using good quality unbleached bread flour which has a higher protein count. More protein = more gluten. More gluten means more glue like structures that trap and hold the gas formed by yeast fermentation. And all that gas is what allows the bread to rise, making it the light, fluffy, chewy pizza dough we all love so much. Gluten is made when we mix and knead the dough. In fact, manipulating the dough in any way allows more proteins and water to find each other and link together. So good flour, lots of mixing and kneading, and allowing the yeast do their job are all essential steps to making a really good pizza dough. I use King Arthur Unbleached Bread Flour which can be found in many grocery stores. Bread Flour contains more wheat protein than All Purpose, which allows for more gluten formation. Yes, you can sub in some whole wheat, but not too much. Maybe up to 1 cup max. Note: Amazon Affiliate Links allow me to earn a small commission on any purchase you make with no additional cost to you. To ensure you have good working yeast, and give it a head start, you want to proof or activate your yeast. I do this by heating 1 cup of water in a microwave for exactly 50 seconds. I have found this to be the perfect temperature for allowing the yeast to wake up and start reproducing. Stir in 1 Tbs of sugar to give the yeast something to eat, and then stir in the 2¼ tsp of yeast. Allow them to work or proof for 10 minutes, your slurry should look like this, nice and bubbly. Once the yeast is proofed, I add 1 tsp of Salt, and usually some spices for additional flavor. I use 1 tsp of Italian Seasoning and ½ tsp of garlic powder, then add the flour and mix. Mixing and kneading are vital to forming the gluten in the dough, and to do this I use a stand mixer with a dough hook. Can you make this recipe without one? Sure, but it will be a lot of work to get the same quality dough. A stand mixer with a dough hook will make this dough in about 5 minutes. If you do it by hand, you should knead the dough on a well floured surface until it becomes smooth and elastic for at least 10-15 minutes. Once my dough starts pulling away from the sides of my stand mixer, I know it’s ready for the rise. Cover the bowl with saran wrap. I found that wetting the sides of my bowl with water allows the saran wrap to stick better. Now cover the bowl with a kitchen towel and place it in a pre-heated over for 60 minutes. Tip: Turn on your oven – any temperature will do, and set your timer for exactly 1 minute. After the time is up, turn OFF the oven. It is now the proper temperature for your dough to rise. After the hour is up, remove the dough from the bowl and punch it down, Now stretch the dough into a tight ball and cover it again to rest for an additional 10 minutes. The dough is now ready for your pizza pan. I hand stretch my dough into shape and never use a rolling pin. Using your fingers to gently stretch the dough outwards from the center accomplishes the same thing and you have a lot more control. 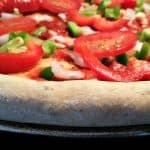 Once your dough has taken shape and you stretch it onto your pizza pan – I usually place it in the oven BEFORE adding any toppings to allow it to rise a little bit more, and to start preheating my oven. Carefully remove your dough after 5 minutes and apply your favorite sauce. My favorite is one I’ve been making for years. I’ll post a link to my Ultimate Fat Free Pizza Sauce here. The toppings are completely up to you. Spinach? Why not. Artichoke Hearts? Sure thing. Onions are a must have on mine, Red Bell Peppers too. And the wife has to have Mushrooms – the more the better. 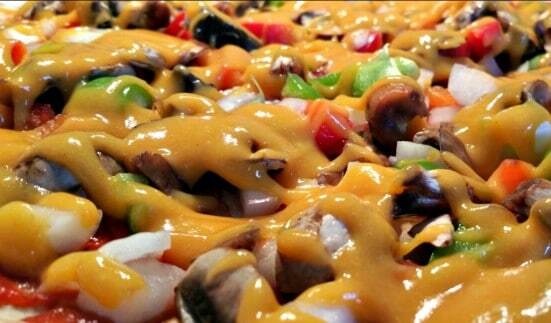 In New Mexico, Green Chile Pizza is very popular, so use whatever you have on hand or like. The sky’s the limit. And cheese? Sorry – not on THIS pie! 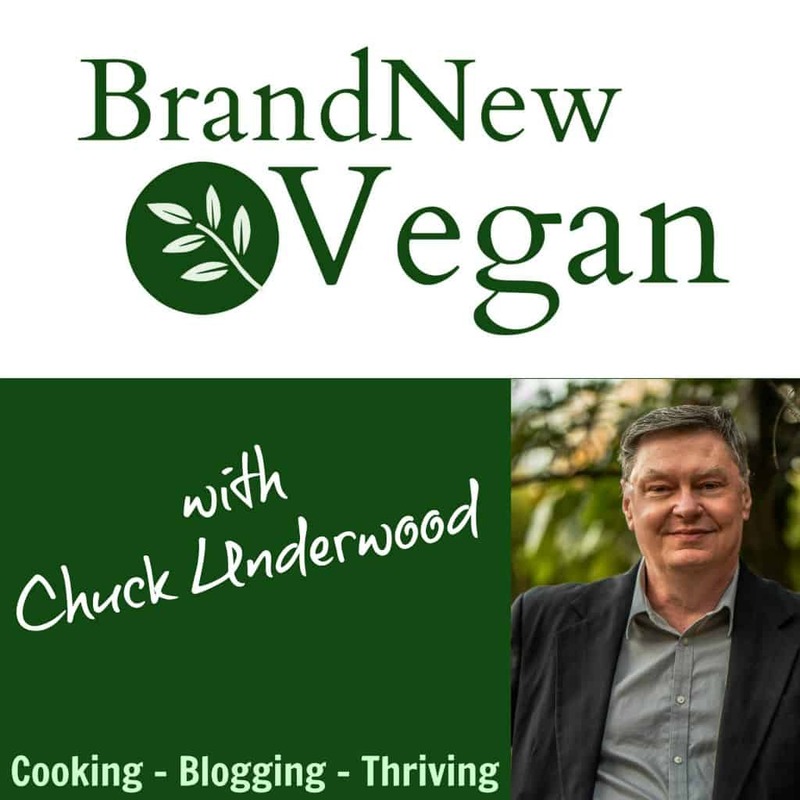 Although I have used my Amazing Vegan Cheese Sauce before and it was pretty nummy. 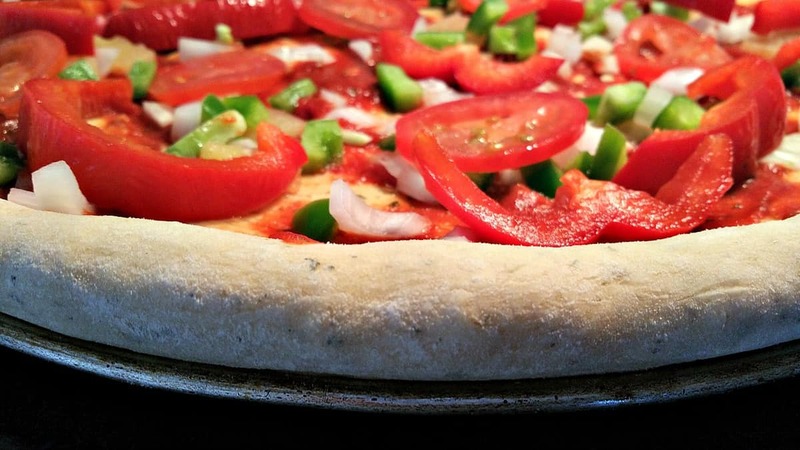 So that’s it….my long and drawn out procedure for making MY kind of homemade Vegan Pizza. It truly does take some time, and patience, but it is STILL, hands down the BEST pizza I have ever tried. 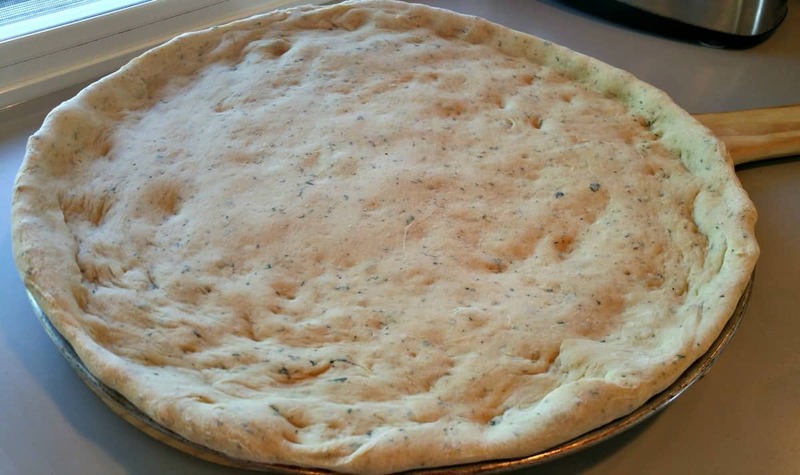 Here it is - my absolute FAVORITE Herb Crusted Pizza Dough. It take a little time, but the results are out of this world good! 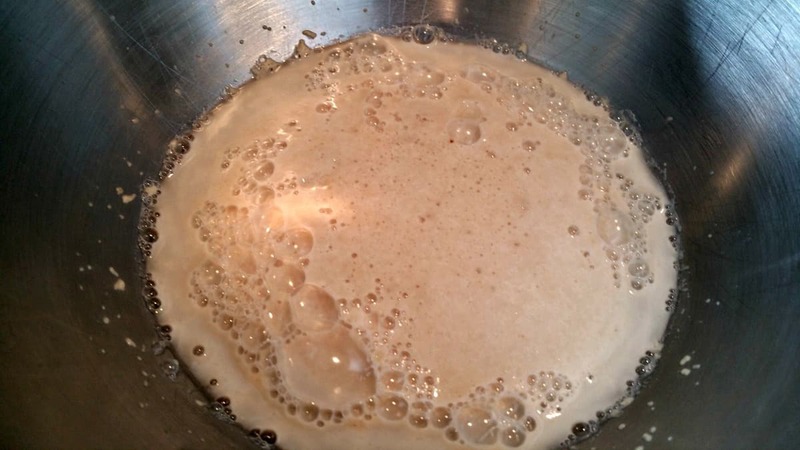 Mix warm water and sugar together and add yeast. Is 2 1/4 tsp. yeast the same as one of those little 1/4 oz. active dry yeast packets? You can make the dough using a bread machine and letting it rise in the machine and then making the pizza. Have you made a Cauliflower Pizza crust yet? No…..I am not low carb or gluten intolerant, so I LOVE my normal pizza dough. Chuck, What size pizza pan do you use for this recipe? I saw a segment about a pizza shop, the 14 year old son hand tossed most of the pies. When asked how he learned he said he started by tossing a lightly dampened towel and moved on to dough. comparable to a large. .. however many inches that is. …14? 18? In our neck of the woods a 14″ is a medium, 16″ a large, and 18″ is a family size. Thanks for the recipe, Chuck. I’m curious — what keeps the dough from sticking to the pan? I’m terrified that after all that work, I’d end up scraping the top layer of the pizza off and leaving most of the crust behind! flour your pan and the underside of the dough! I ended up using the instructions that came with my yeast which was 2 1/4 tsp yeast; 1tsp sugar; 1/4 cup warm water. Then I mixed the dry ingredients together but included the rest of the sugar (2 more tsp), and the rest of the water (3/4 cup), in the end, giving me the same proportions of water and sugar as in your recipe. I also added 3 tbl spoons of olive oil, and 1tbl spoon italian herbs to the dough. It turned out really yummy! If using your vegan cheese sauce do you put that on before cooking or after the pizza is out of the oven? I think you could do either….. but I’ve done it before cooking and it was fine. Can you save the finished dough in the freezer? Never tried it, but I don’t see why not. What do you mean by “warm oven”? Should I put it on 350? Thank you! To warm up my oven for letting the dough rise – I turn on my oven for exactly 1 minute (any temperature) and then turn it off immediately. Now it’s warm. 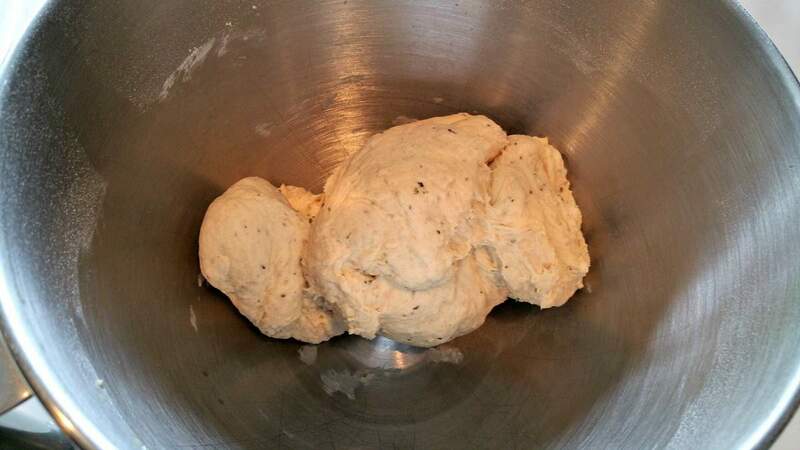 We really enjoy the herb crusted pizza dough recipe. Fortunately I had some corn meal on my sheet pan. The dough did stick in some places. Next time I’ll add more cornmeal and flour or I’ll put on my pizza stone directly. We enjoyed the added flavor of the italian herbs and garlic in the dough along with the pizza sauce. I think some of my veggies I’ll roast ahead of time like the zucchini and onion. 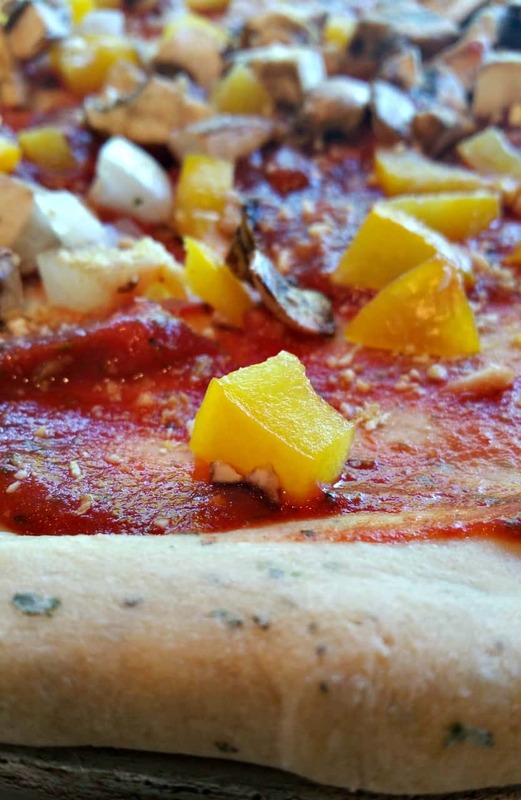 There is a Sweet Earth veggie pizza that’s pretty tasty and it has a vegan cauliflower sauce plus pizza sauce. I guess the cauliflower sauce replaces the cheese… Any chance you can figure out how to make this sauce for us?